Through The Good Times And The Bad, This Fudgy Mug Cake Always Makes Us Feel Better! While desserts that take a little time to put together and are well worth the effort and the wait are always welcome, we really love when there’s a treat that comes together in a matter of minutes, that totally fulfills all our sweet tooth cravings and instantly makes us feel better no matter what the circumstance. In honor of Breast Cancer Awareness month and making peoples’ days just a little bit better, we’ve got the easiest, fudgiest, richest dessert…and it can be yours in five minutes! 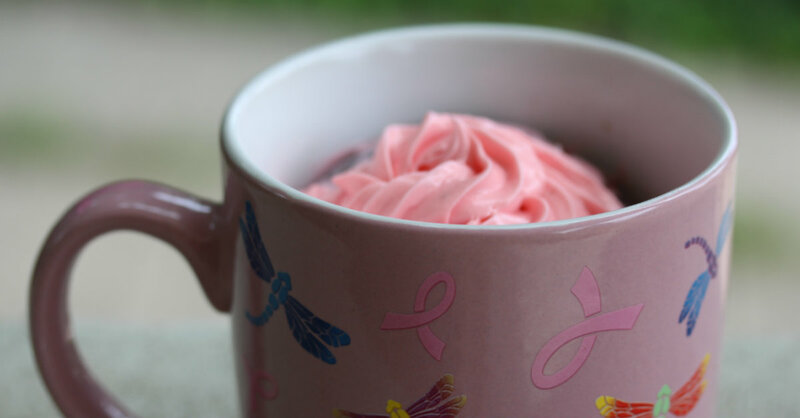 Aside from how delicious this mug cake is, we especially love what we made it in; every purchase of this sweet Pink Ribbon Dragonfly mug goes towards funding mammograms and more breast cancer research. It’s a constant reminder for us to never give up hope and you can contribute to the cause and get your own here! In a medium bowl, combine flour, sugar, cocoa powder, baking powder and salt until mixed together. Whisk in milk, vegetable oil, vanilla extract and espresso granules, and stir until batter is smooth and no lumps remain. Pour 1/2 batter into a large, microwaveable mug and add chocolate morsels. Top with remaining batter and place on a paper towel in the microwave. In a small bowl, mix cream cheese and powdered sugar together until smooth and creamy. Taste and adjust sugar, if necessary. Remove mug cake from oven (and let cool), then frost and enjoy!